Let's be honest - you guys have heard me complain. I've complained about winter. A lot. I've complained about the details of winter as well (short days, cold weather, overall misery). I've also complained, although at much less length, about the challenges of working full time while raising a baby with a husband who works on the road, and about how the baby hates naps (and sleep in general). I've occasionally mentioned other things I don't like as well. This is reality. We all express dissatisfaction now and then, and we all see dark clouds in certain situations. I'm definitely guilty. But in general, I really do try to be positive the majority of the time. I make a conscious effort to see the good in things, and to celebrate the bright side of life as much as possible. I make the choice to be happy. For me, the easiest way to focus on the bright side is to indulge in simple pleasures. No matter how bad my day has been, or how busy or exhausted I am, I find at least one way to experience something I love. Admittedly, this is easier than ever now that I have Essley. Just a few minutes holding, laughing, and playing with her, and I'm in a great mood. But there are so many other ways too. I take walks in the sunshine. I go get my favorite coffee drink. I meet a friend for a margarita at the end of the work day. I pay a visit to a local nursery and bring home a new plant. I listen to my favorite song. I call my best friend in San Francisco or my sister in Indianapolis and talk for an hour. I take a day trip with my family. My husband and I order our favorite take-out for dinner. I eat chocolate and read blogs. I work in the garden. I grill a veggie burger. I take my camera on an errand and snap a few photos of cool things I see. I paint my nails. I go window shopping with my girlfriends. I prop up my feet and eat a Fruttare Fruit Bar. Each one of these is a small (but powerful!) way to celebrate the bright side. My regular readers may notice that, despite the fact that I very rarely do food reviews here, this is the second time I've mentioned Fruttare. And for good reason. 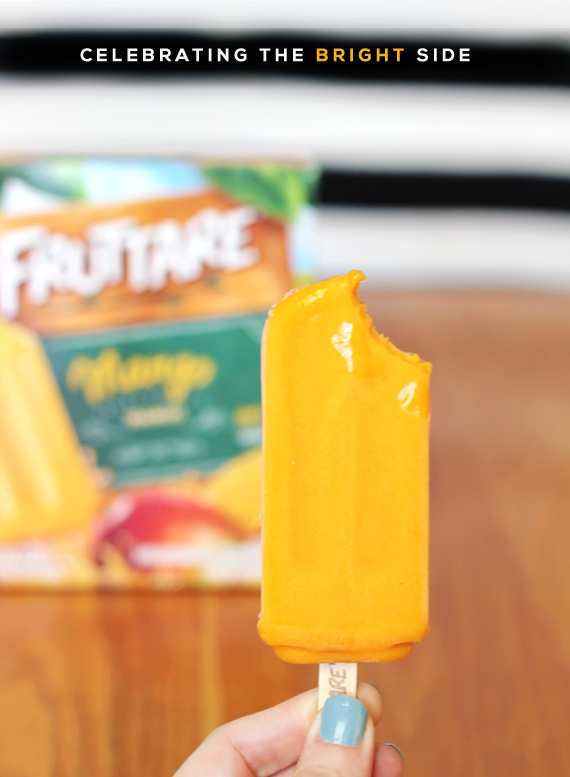 Fruttare Frozen Fruit Bars have become my go-to snack when I want a quick sweet treat from the freezer. I love that they're made from real fruits and juices, rather than strange ingredients that I can't pronounce. 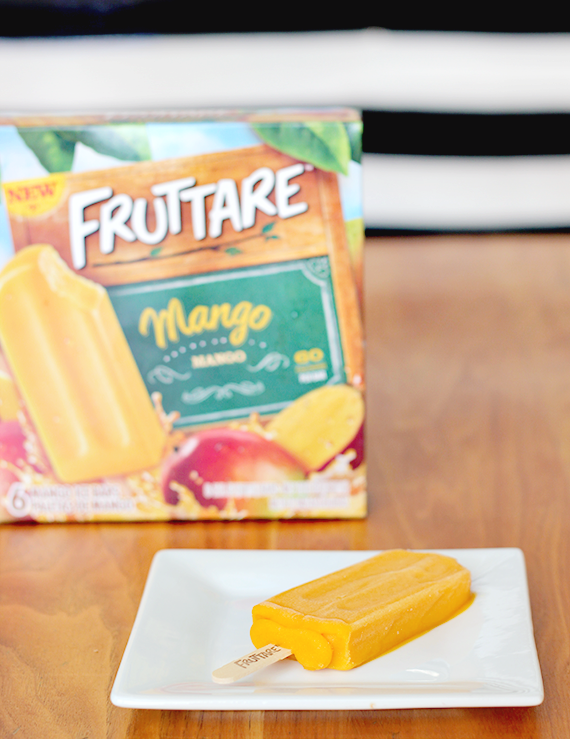 And as a huge fan of mangos (I put them in my smoothies every single morning), I was especially excited to try the Mango Fruttare bars for the first time recently. I wasn't disappointed. They taste like super refreshing, lightly sweetened frozen mangos. Heaven on a stick you guys. Fruttare is also recognized as a brand synonymous with a positive outlook on life, and with the delicious fruit bars they make, it's easy to see why. Sitting on my deck in the summer sunshine, surrounded by my plants and flowers, eating a Fruttare with my favorite music playing in the background is officially one of favorite ways to treat myself, and another simple way to celebrate the bright side of life. How do you celebrate the bright side of life? What are your favorite simple pleasures? Thank you for supporting Bubby and Bean by allowing me to post occasional sponsored content. All sponsored posts feature products or services that I genuinely feel would be of interest to my readers. I was selected for this opportunity as a member of Clever Girls Collective and the content and opinions expressed here are all my own. I'm so with you about enjoying those little things. For me, it's going for a walk, taking a hot bath, or just having a favorite drink/snack. 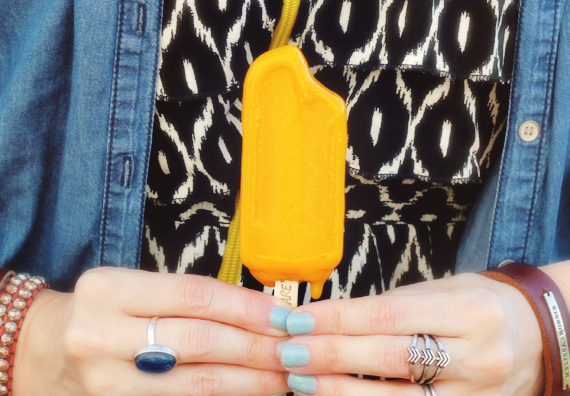 Those fruit bars look like the perfect summer snack! Those look REALLY yummy! Hope little Essley starts sleeping more soonest. It's true, life really is about the simple pleasures. For me it's doing yoga in the morning before work and ending my evening with an episode of TV while snacking on a toasted English muffin (often with a side of chocolate.) 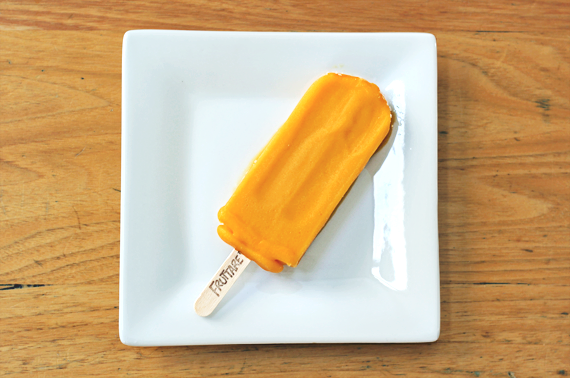 But I may just want to change that up for summer because the idea of frozen mango on a stick sounds pretty amazing! It's the little things in life, isn't it :) Looks simply delish!